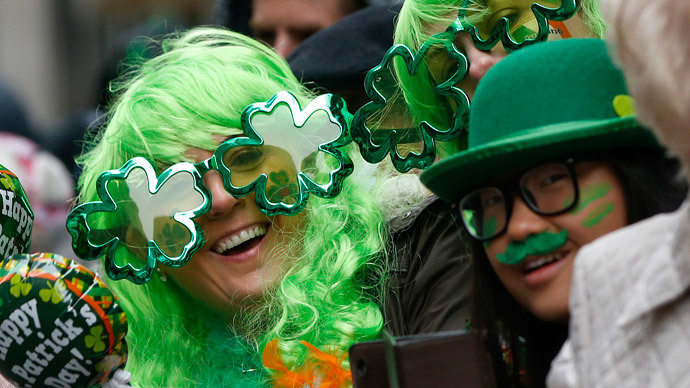 Australian PM Tony Abbott has been criticized after recording a well-wishing St. Patrick’s Day video message. In the address, condemned by his Irish counterpart, he was accused of promoting the perception that Ireland is synonymous with alcohol. However, towards the end of the recording, he said it was a shame that “I can’t be there to share a Guinness or two or maybe even three.” These comments did not go down well with Irish Prime Minister Enda Kenny, who was in Washington for a meeting with US President Barack Obama. "I've heard the prime minister's comments. He made them. I don't agree with that," Kenny told the Irish Independent. “I think that it is perfectly in order for so many Irish people in Australia to have an enjoyable celebration of St Patrick's Day and St Patrick's week, and to do so in a thoroughly responsible fashion." Kenny added that "There has been a long-term view of a stage Irish perception. I reject that. I think it's really important that we understand that we have a national day that can be celebrated worldwide, St Patrick's Day." During the video message, Abbott also found time to have a ‘dig’ at environmentalists, saying “It’s safe to say that this is the one day of the year when it’s good to be green,” pointing to his green tie, which he was wearing during the video recording. To make matters worse for the embattled Australian prime minister, his Defense Minister, Kevin Andrews also drew a link towards St. Patrick’s Day, by tweeting a picture of himself holding a can of Guinness. Controversy is nothing new for Abbott, who came in for a barrage of criticism in January after granting an Australian knighthood to Queen Elizabeth II’s husband, Prince Philip, to mark Australia Day. The move was not well received by the country’s Republicans, who would like to see the country move away from having the Queen as their head of state. Indeed, quite a few monarchists were not impressed either. Commentator and associate editor of the national daily, the Australian, Chris Kenny tweeted, "Just another own goal and an embarrassment for Australia on our national day,” according to Reuters. Other critics of the English-born, Australian PM said he was out of touch with the opinions of the majority of Australians. Abbott subsequently survived a challenge to his leadership on February 9 after his ruling Liberal Party voted down a motion to dismiss him in the wake of the knighthood scandal. In a party room secret ballot, a vote to declare the positions of party leader and deputy leader vacant was defeated by 61 votes to 39, a party official told reporters. In October, Abbott memorably said he would “shirtfront” Russian President Vladimir Putin at November’s APEC summit in Beijing, for what he believed was Russia’s perceived role in the downing of Malaysia Airlines Flight MH17 over southeast Ukraine, which killed 27 Australian citizens. However, at the APEC summit, rather than ‘shirtfront’ Putin, which is an Australian Rules Football term for illegally tackling a player, Abbott seemed to be more interested in getting better acquainted with one of Australia’s indigenous marsupials. Rather than getting to ‘grips’ with Putin, Abbott seemed to be more than at home cuddling a koala and was ridiculed on Twitter both at home and abroad.